The Deering Maple Blossom is made from eastern violin grade curly maple, stained with a dark walnut stain, and adorned with flower mother of pearl inlays. Now featuring a radiused fingerboard! A radiused fingerboard is an arched fingerboard which you will find on most electric and modern acoustic guitars. 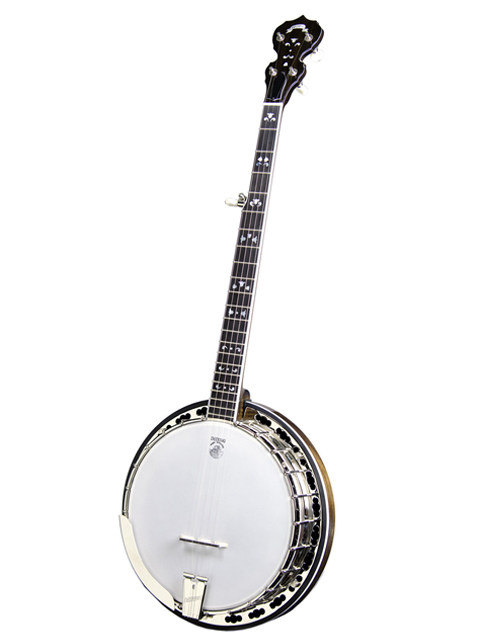 This arch fits the fold of your hand better and makes it easier for both your left and right hand to play the banjo. The Maple Blossom has the 06 tone ring with a very comfortable radius fingerboard. This has been a great model for Deering for many years, but has just recently become a radius model.